This book describes the different types of online stores, how they operate, important features to consider, and key business operations such as fraud management and customer management that you should know about. 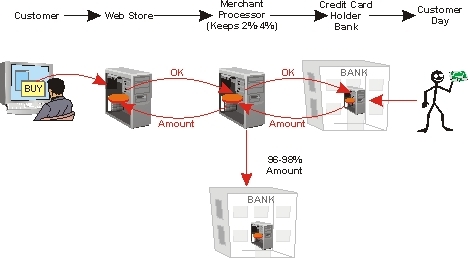 This diagram shows the basic steps in online store credit card processing. This diagram shows that when the customer places an order, it goes through the web store server. The web store sever then sends the credit card order amount to a merchant processor. The merchant processor identifies the bank associated with the credit card and sends the information to that bank for processing. If the bank authorizes the transaction, the merchant processor will begin the steps to transfer the money to the online store's bank. The merchant process will keep approximately 2% to 4% of the transaction for their processing service. You will learn about the different types of online store hosting options ranging from online malls to customer software solutions along with their typical capabilities. Discover how to evaluate the different features and options to help you determine which type of store is right for you now and how you might need to evolve to new types of stores as your business grows. Learn about the ways that you can create online catalogs, what they contain and how you can group and manage products so customers can easily find and order them. Product page layout guidelines are included along with key online store navigation requirements that will help search engines to find and index your store. Order processing steps are explained ranging from simple inserting Paypal buttons on a web page to sophisticated shopping carts that can remember and process items for checkout. You will discover the different types of payment processing options including credit card, cash, online payment, and on account and how to get and setup online merchant accounts. Discover ways to setup reliable order fulfillment processes and ways that you can use order fulfillment to increase your sales. You will gain an understanding of the different types of available shipping options and how their costs and reliability can vary based on geographic region. Learn about fraud management including identifying suspect orders and how to avoid unnecessary bank processing fees. Discover that merchant processing banks can impose significant penalties for fraudulent purchases (that they initially validate as good) and ways to avoid these penalties. Discover how online store systems may integrate with marketing programs such as affiliate links and coupons. You will learn about additional revenue sources including how to sell and include advertising in your online store. Learn why and how to link online stores to databases and accounting systems using standard file formats.